We have reached the point where we can digitise life itself, albeit at a micro scale, and that opens up a whole host of new opportunities, from being able to create bespoke synthetic organisms to teleporting life across the universe. The chance of a new pandemic breakout, whether it’s Bird Flu, Ebola, Swine Flu, or some other highly deadly, contagious disease, is increasing, and as moving around, from village to village, city to city, continent to continent gets easier and cheaper authorities are concerned that the fall out could affect millions of people. And as if that wasn’t bad enough there’s also concern that today it still takes too long to genetically decode deadly pathogens and mass produce vaccines, for example, during the Ebola outbreak in 2014 that killed over 11,310 people,it took the world’s leading pharmaceutical companies months to produce new doses, and by that time most of the infected people had died. Since the deadly Ebola pandemic though a new vaccine that’s 100 percent effective has been trialled and tested successfully, researchers are experimenting with contagious vaccines and DARPA, the US military’s bleeding edge research arm, has kicked off its P3 Program, that aims to stop pandemics dead in their proverbial tracks within just 60 days of the first outbreak. Now though experts and doctors looking to fight pandemics faster, as well as astronauts and space agencies, something I’ll come onto later, have a new tool in their arsenal – they can ‘teleport’ viruses. The first biological teleporter, a first of a kind, sits in a lab on the lower level of the San Diego building that houses Synthetic Genomics Inc. (SGI), and it looks like something like a big hospital cart. It’s actually a conglomeration of small machines and lab robots that are linked to each other to form one big machine, but unlike any other device on Earth this one’s special – it can transmit digital code and print viruses. In a series of experiments that culminated last year, SGI scientists used genetic instructions sent to the device from elsewhere in the building to automatically manufacture the DNA of the common flu virus. They also produced a functional bacteriophage, a virus that infects bacterial cells, from scratch – something which in itself is almost, but not quite a first of a kind, and although that wasn’t the first time anyone had made a virus from DNA parts, it was the first time it was done automatically, without human hands, by robots. The device, called a “Digital-to-Biological Converter” (DBC) was unveiled in May, and even though it’s still a prototype, instruments like it could one day broadcast biological information from sites of a disease outbreak to vaccine manufacturers, or print out on-demand personalised medicines at patients’ bedsides. … Not bad for something that in the 1980’s people would have just simply called a “weird” fax machine. “We have been dreaming, for about a decade, of the ability to fax life forms,” says Juan Enriquez, an executive with Excel Ventures, a venture capital firm that has invested in SGI, who imagines it will kick start a new industrial revolution. Unlike Venter, who’s known for boasts and big scientific plans, Gibson is best known among biologists for the “Gibson Assembly,” a reaction that joins small pieces of lab made DNA into much larger genes. 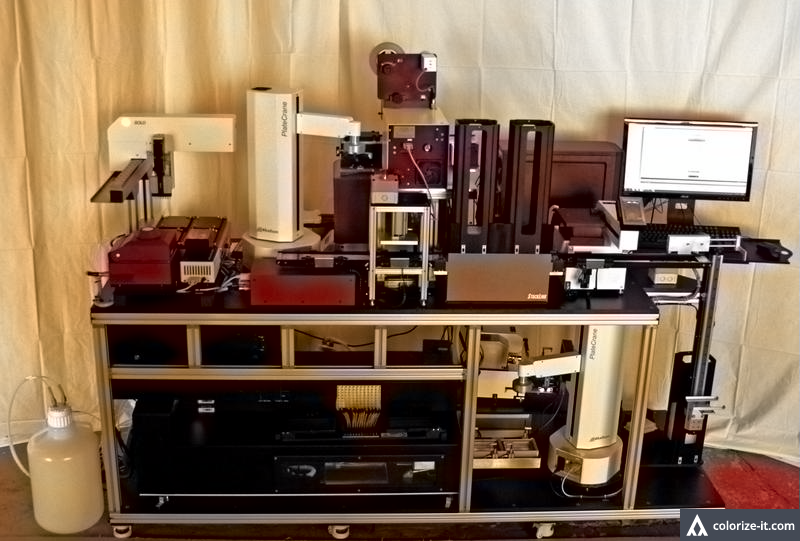 At the heart of the DBC is SGI’s BioXP 3200, a commercial DNA printer, and when Gibson, sitting in his office, sends a message to it, it begins its work using pre-loaded chemicals, but he could just as easily send such a message from anywhere. Their chance came in March of that year when Chinese authorities reported H7N9 flu infections and posted the bug’s DNA sequence data online. Two days later, without direct access to any specimens, only the digitised sequences, SGI had synthesised the H and N genes on Gibson’s DNA printer. Those DNA strands were shipped to Novartis, which used them to generate virus stocks containing the new genetic information – the kind used in vaccine production. Gibson says that’s when the idea for the DBC became real. “I said ‘Can’t we integrate everything into one box?” he recalls. Imagine, he says, that the Centers for Disease Control and Prevention in Atlanta unravels the genetic instructions for an antibody to a disease like Ebola threatening to create an epidemic. That code could be streamed digitally to converters at “every hospital around the world” to start making the antidote. Furthermore, and something he didn’t talk about, it could also be used to crowdsource a solution. The possibilities it seems are endless, but even though the ability to program life and have it appear in different places is startling, just how useful biological teleportation will be remains debatable. Creating a small amount of seed virus stock is important, but it’s only one step in manufacturing enough vaccine for a whole country. The weakened viruses that go into flu shots usually has be grown by the trillions in chicken eggs, a very carefully planned process that takes half a year. Although as I alluded to earlier this is a problem that one day might be overcome by using contagious vaccines that create what’s called “Herd Immunity” with just a single dose, not millions like we’d need today. Additionally the DNA strands made by SGI’s converter still suffer from errors, or random mutations. Gibson says he is attacking the error rate problem and is also trying to the device down. While it’s very easy though for people to run ahead of themselves and say that SGI has printed life, they haven’t yet because most biologists don’t believe that viruses are “alive,” but one day that could all change. In 2016, SGI announced the creation of a “Minimal cell,” a bacterium with the smallest ever genome and which could serve as a kind of blank cassette to accept new genetic instructions. Gibson says that since the “minimal cell is the simplest form of life” it might be logical to try to print one. That data could then be transmitted to an earthbound converter, which would reconstruct the alien life, perhaps in a high-security lab. An SGI team spent time with NASA scientists in the barren Mojave desert in 2013 testing aspects of the theory. “We loaded up a research lab bus with all the stuff we needed, isolated some samples and sequenced them,” Gibson says. Sending life data into space could be even more interesting. According to one theory of how life emerged on Earth, known as “Panspermia,” it was carried here on a meteor or comet. Sending biological converters into space could be mankind’s way of returning the favour, Enriquez says, seeding life elsewhere. However, back here on Earth I’ve got to ask you the question – if you could “teleport” a clone of yourself to another point in space, or even time, now that we have a formula for it, would you?